Rob Heinsoo: Big Trouble in Little China! Big Trouble in Little China! GenCon is going to be fun this year! In addition to however many volumes of 13th Age we have out by and for the show, I'll be enjoying the release of a new game from Upper Deck based on my favorite deckbuilding card game. I've been a Legendary fanboy since Devin Low invited me to early playtests. You'll find my wife Lisa and me in the playtesters list for most of the Marvel Legendary sets. So it was wonderful to design a Big Trouble in Little China set intended to be playable with the Marvel sets. The Villains and Masterminds and Schemes can all add something new for people who want to draft big trouble into their Marvel games, and Iron Fist could pay a visit to Little China. But BTiLC is very much its own experience, with interlocking characters and mechanics that want to be played together, as well as new Schemes that pivot around Chinatown. I'm particularly happy with the story-oriented solution for handling the starting heroes, but it's a little too soon to spill those beans. I'll say more about the game's design goals and solutions in future posts. This was so much fun to make! 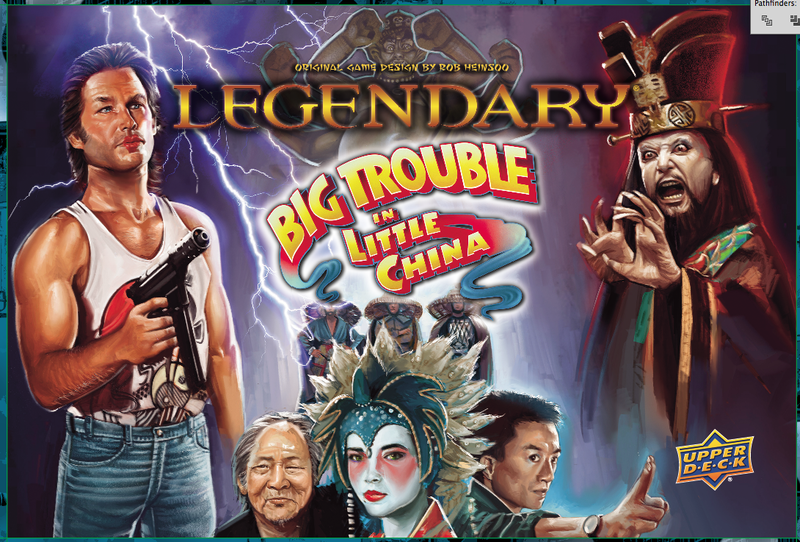 The result is sort of a love letter: Legendary is Lisa's favorite game, and Big Trouble in Little China is designed to be Legendary the way Lisa likes to play it. Except for the worst of the Masterminds . . . Lisa saw that Mastermind and said "Oh. You just designed this to screw me, didn't you?" Me: Not you. Your play style.